Building blocks are a foundational childhood toy, yet we love how people keep creating new versions with lots of variations. Korxx’s blocks are made from sustainable cork and are safe for small kiddos to stack and build with since they are free of chemicals and have a texture that makes stacking easy and slip-resistant. The pressed cork blocks, which are available in square and rectangular shapes as well as oval and circular pieces, are free from phthalates, dioxins, formaldehyde and come in a natural color or multicolored vibrant hues. Available in a variety of sizes and sets, the blocks come in a reusable bag or a wood box for storage. These light stackers also have the benefit of being quiet as they tumble to the ground, which means one less loud crash contributing to the soundtrack of life with kids. Building blocks are a foundational childhood toy, yet we love how people keep creating new versions with lots of variations. 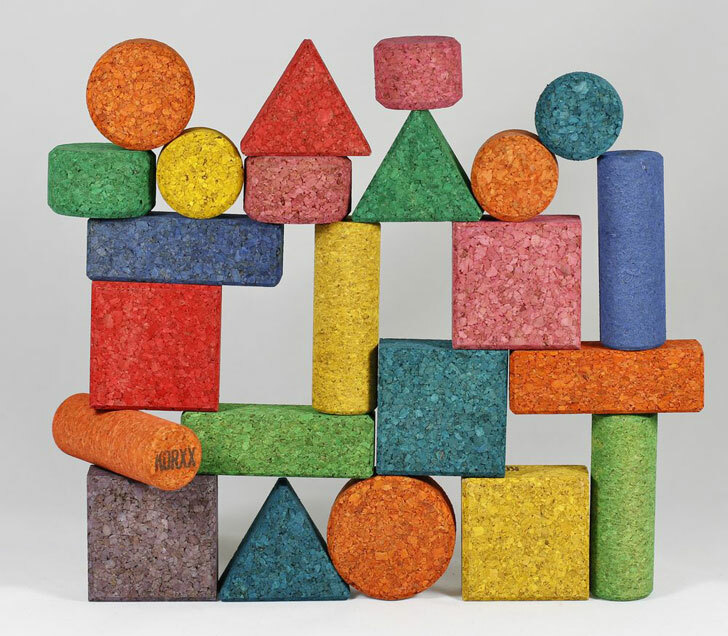 Korxx�s blocks are made from sustainable cork and are safe for small kiddos to stack and build with since they are free of chemicals and have a texture that makes stacking easy and slip-resistant. The pressed cork blocks, which are available in square and rectangular shapes as well as oval and circular pieces,�are free from phthalates, dioxins, formaldehyde and come in a natural color or multicolored vibrant hues. Available in a variety of sizes and sets, the blocks come in a reusable bag or a wood box for storage. These light stackers also have the benefit of being quiet as they tumble to the ground, which means one less loud crash contributing to the soundtrack of life with kids.